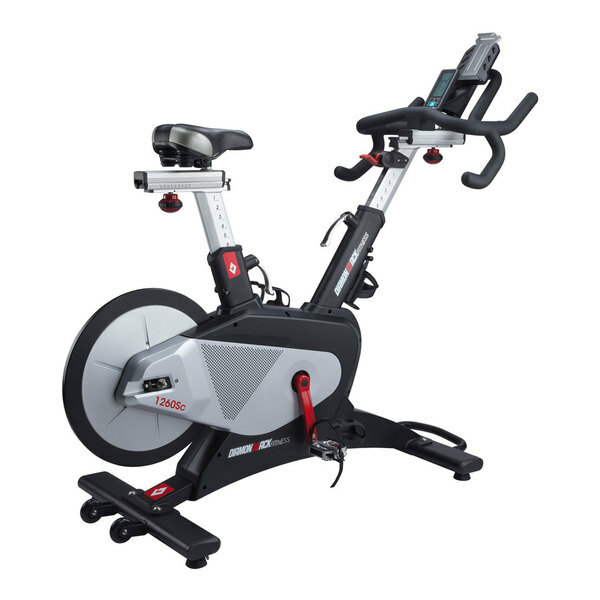 The 1260Sc is the newest exercise bike in Diamondback's solid lineup, a rear wheel studio cycle similar to what you might find at your local health club. It can connect with any fitness apps or wearables that are ANT + compatible (as opposed to Bluetooth), so you can keep track of your workouts and monitor your progress. The 1260Sc also allows for plenty of customization so you can have the most comfortable ride possible. The bike features a sleek V-frame with a rear mounted wheel, multi grip handles and a basic but functional Watt Output computer showing your speed, distance, calories, RPM, pulse and more. Check out the popular 1260Sc on Sale at the Company Store! The first thing you should know about the new Diamondback 1260Sc Studio Bike is that it is more of a commercial-grade bike than the rest of the series. So whereas the 510Ic and up-level 910Ic are built for home use, the 1260SC is built for in-studio use my multiple people. It's rugged, sturdy and has all of the extra touches you'd expect from a club quality cardio machine. Does that mean you can't buy it for your home? Of course not. It's actually a great option for your home gym, and something that will last for years no matter how hard you train on it. The 1260Sc has a belt drive system with 16 resistance levels that can be easily adjusted with the convenient lever system. We found it challenging even half way up at 8, so those 16 levels will be enough no matter what your fitness level is. There's also plenty of adjustability here. You can move the handlebars up and down as well as fore and aft. Same thing for the seat. There's also plenty of places to put your hands on the multigrip handlebars, which helps fight fatigue. Many indoor cycling bikes don't give you that versatility. You can choose from standard SPD clipless pedals to mimic an outdoor ride. 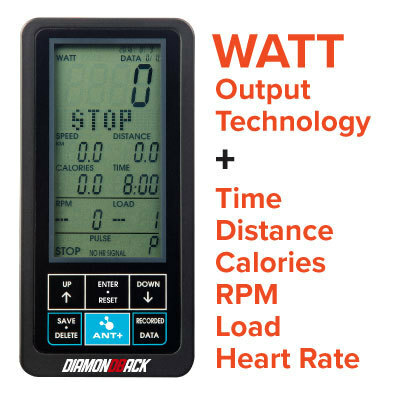 To help motivate you the Diamondback 1260Sc is equipped with ANT + compatibility, which allows you to tap into all kinds of fitness programs and sync your results with any wearable trackers that you have. You can access programs like Zwift, where you can do virtual rides, cycling workouts and group training, which makes your sessions much more enjoyable and rewarding. The LCD console is easy to read and gives you basic feedback on your workouts. The 1260Sc has a 300 lb. maximum user weight capacity and can accommodate users from 5'2" all the way up to 6'5". How Does the 1260Sc Compare to the Other Diamondback Bikes? There are currently seven Diamondback exercise bikes on the market today: two recumbents, two uprights, two indoor cycles and the studio cycle. All are well made and well designed, with varying features and capabilities. You can't really compare the 1260Sc to the recumbents and uprights, as they are different types of bikes. The better comparison is to the two indoor cycles. So let's take a look at the three of those bikes to see how they compare to each other. The 510Ic has a 32 lb. 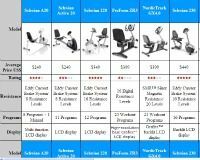 flywheel and 16 resistance levels, with 12 built in workout programs. It weighs 104 lbs. and can accommodate users up to 300 lbs. The 910IC has a 40 lb. flywheel and 32 resistance levels, with 12 built in workout programs. It weighs 135 lbs. and can accommodate users up to 325 lbs., and adds wireless heart rate monitoring and more customization. The 1260Sc is much more durable and adjustable, has a 31 lb. 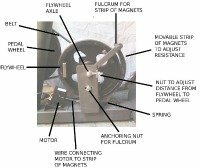 flywheel and 16 resistance levels. It weighs 130lbs. and can accommodate users up to 300 lbs. Unlike the 510Ic and 910Ic, it features a rear wheel design to eliminate corrosion from dripping sweat, plus ANT + connectivity for app syncing and workout tracking, something missing from the other two models. So the 510Ic is going to be a great entry level choice for use by one individual...the 910Ic is a step-up model for more than one user...the 1260Sc is the top of the line club quality model for more serious users or group training. The new 1260Sc is a welcome addition to the Diamondback lineup, the first commercial-grade studio cycle that they offer. It's ideal for those who are a bit more serious about their training, and want something comparable to what they might find at their health club. You can choose the ideal seat, handle and pedal positions for your needs, and link up with a wide variety of fitness apps and wearable devices so you can keep tabs on your workouts and keep working towards your fitness goals. This one might present a strong challenge to the Keiser spin bike, one of the most popular indoor cycles on the market today. We shall see what happens with this one. In the mean time, the 1260Sc is certainly worth a look if you're in the market for a high end studio bike for your home.